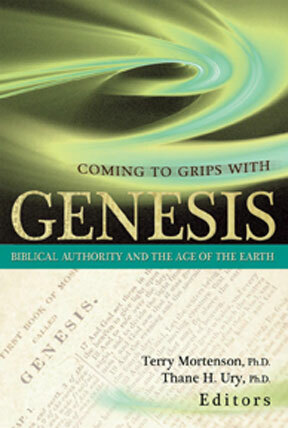 In November Coming to Grips with Genesis will be made available by its publisher, Master Books. I am excited about the publication of this book for a couple of reasons. First, the content of the book is aimed to provide a readable, academic defense of key biblical subjects related to the age of the earth. This book is made up fourteen chapters written by scholars from various ministries, all of whom share a commitment to young-earth creationism. The book is targeted for seminary and Bible college professors and students. Second, the purpose of this book is to provide a collection of essays to honor Dr. John C. Whitcomb, Jr. With the publication of the Genesis Flood in 1961, Dr. Whitcomb and co-author, Dr. Henry M. Morris, became catalytic figures in reviving young-earth creationism. The fourteen different authors who contributed to this book have made other contributions to recent creationism and have been influenced by the ministry of Dr. Whitcomb. Because I had Dr. Whitcomb as a professor at Grace Theological Seminary and have also done some writing on biblical creationism, I was asked to contribute the chapter that evaluates the framework interpretation of the creation account. Because I have read so much of Dr. Whitcomb’s material as well as having a great appreciation for his instruction as a seminary professor and godly example (check out DBTS‘s 2007 William R. Rice Lecture Series), I am delighted to be able to dedicate my chapter to him. Here is the arrangement of the content of Coming to Grips with Genesis. 4. Is Nature the 67th Book of the Bible? 6. The Genre of Genesis 1:1-2:3: What Means This Text? 7. Can Deep Time Be Embedded into Genesis? 10. Do the Genesis 5 & 11 Genealogies Contain Gaps? 1. Biography & Bibliography of Dr. John C. Whitcomb, Jr.
To find out more information about ordering Coming to Grips with Genesis, go to the New Leaf Publishing Group. If you live in the Allen Park area of Michigan, a copy of this this book may be purchased at the Inter-City Christian Bookstore, 4635 Allen Road, Allen Park, MI 48101 (phone number: 313 383-6110).